Forty one years ago last saturday, on April 25 1974, a military coup has put an end on forty eight years of dictatorship, on which many lost their lives fighting for freedom, and on thirteen years of a colonial war in Africa - the Carnation Revolution. Unfortunatelly a couple of decades later a bunch of wannabes who have grown inside the major political parties got into power and have been ruling this country as if it was their farm. Incompetent, greedy and corrupt politicians walked hand in hand with banksters and big economic groups. 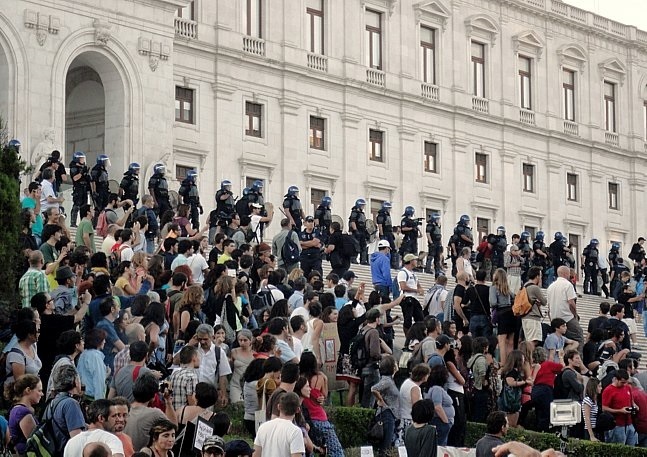 In 2011 Portugal was one step away from bankrupcy and needed a 78 billion bailout. Therefore, the people had to pay for what those criminals have done and the greatest austeririty ever seen became a reality on everyone's lives. About 350.000, mostly qualified people, left the country and the poors have reached 3 millions. However, the number of millionaires was never so high, showing how 'fair' these political/economic measures are for the 99% of the Portuguese. Several thousands of protests have taken place. The photos that follow show major marches (civil initiatives) in the last years. 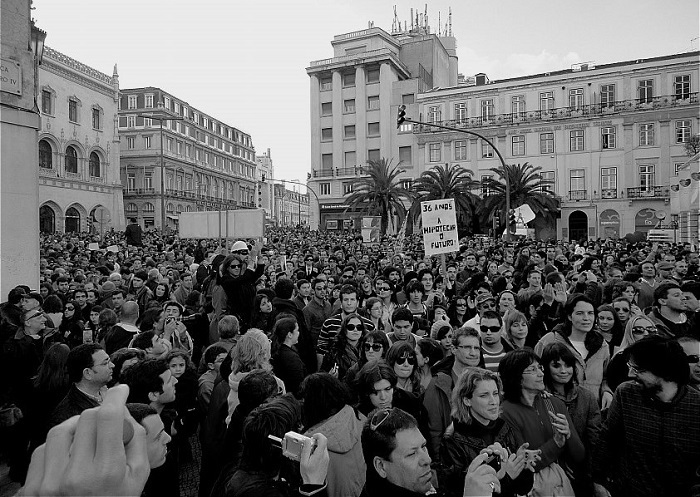 This is my contribution to the CDP May Theme Day: "Revolution"
JM, you are THE documentarian of the unrest in Portugal. Great photos. Very vivid shots- and perhaps a sense that revolution isn't that distant a thought. I do hold good thoughts/prayers for your country, Jose! Thank you for this post!! very powerful post ... 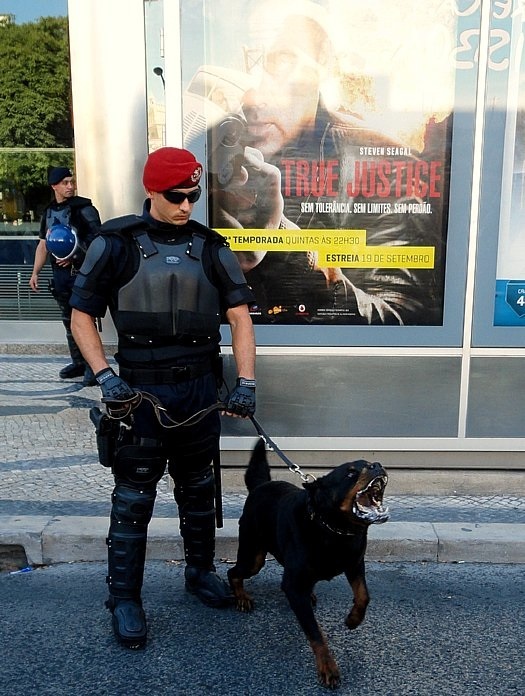 I find the most powerful visual to be the dog baring it's teeth with a "true justice" movie sign in the background. Brilliant series of photos. I understand. That's the agenda of the Republican Party in this country. That shot with the soldier, dog and poster is very powerful. Amazing photos. That dog sure looks mean. It's a sad story. Good that the people take to the streets to protest. You photo with the dog should have a prize. I hope there's an end in sight to all this corruption, mismanagement and bad government, so that young and old can have a decent life again! Brilliant series with amazing photos. Excellent choice for this theme ! This has to be the all time best interpretation of the theme. You've document a very real and very recent revolution. The divide between the rich and poor just keeps getting bigger and bigger and way too many politicians seem to think that's a good thing. I agree with Sharon, brilliant and relevant post Jose, couldn't be more perfect for the theme. Powerful post, Jose. The pictures were amazing. Wow! Great post for the theme this month. That divide is happening in America, too. History has shown that it can't last, revolution must happen. I think it was Mark Twain who said, "History doesn't repeat itself, but it echoes." A great theme day post. It tells the people that something is not above board when the number of millionaires grows, and the number of poor people grows, too, Jose. There is a particular elite, in each country around the world, who have a feeling of entitlement that all the spoils of the work of the poor should first come to them, and THEY will be the ones who determine how much will trickle down to their less powerful countrymen. And they are aided and abetted by the media, and by the church. Super take on the theme, JM. Sadly the rich in every nation walk all over the poor. Greed is so evil! What a parade of sad facts and impressive images! Excellent post, bravo José! A very well put together post. When I saw the revolution theme for City Daily Photo members a couple weeks ago I immediately thought of you, knowing what your country has gone through the past couple of years. You've definitely seen revolution up close. Love all your photos. They remind me of old Life magazines! Truly newsworthy and great photographic examples. What a great series of shots Jose. I was so impressed with the first one and then each one seemed even more interesting. An especially good take on the theme as well. Each of the images are very strong! You'd be a certified fool to mess with those teeth. Revolt or not. This is a REAL revolution. Nice pictures. I remember some of these terrific photos. Sometimes one must take to the streets to effect necessary changes as the powers-that-be are so corrupted nothing else can be done.